Single channel video installation, Colour, Sound. Being Seen Trying is an ambitious room-sized video installation. Viewers encounter the pixelated imagery of a crowd at prayer. 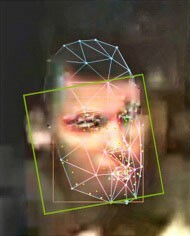 Each individual, with face contorted, using face recognition software, is projected onto a separate pane of glass. The footage used in the artwork has been sourced from a host of online ceremonies (or online Darshans) at which devotees are given sight of the temple deity. This site (Darshan) is considered auspicious. Observing that many now pray in front of computers, Charuau investigates how the Internet processes a prayer. 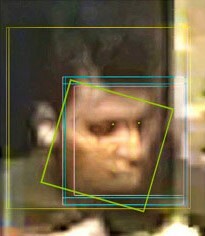 The footage also recalls online surveillance technologies. The preoccupation of the artist’s research, is to make sense, in this digital age, of the profusion of images generated every single second by humans and machines. Images survive and float on top of this tsunami. They are often disconnected from their creators and their places of origin; they exist because they have to. 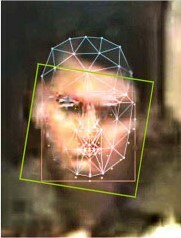 The auto-generation of images, through the Internet or modern visual technologies, fascinates the artist. He feels the process contains a spiritual quality.